The sinking ship that is Toys R Us has, after months of the same minor discount, increased its store-wide sale to 30-50% of everything in the store. For some this may be too late as many stores have no doubt been cleaned out of Transformers and other big-name brands at this stage of the game, but for others this may be a good time to strike before all the good stuff is gone. The liquidation sale also includes Babies R Us, so those looking for cheap baby toys and supplies may want to act soon. 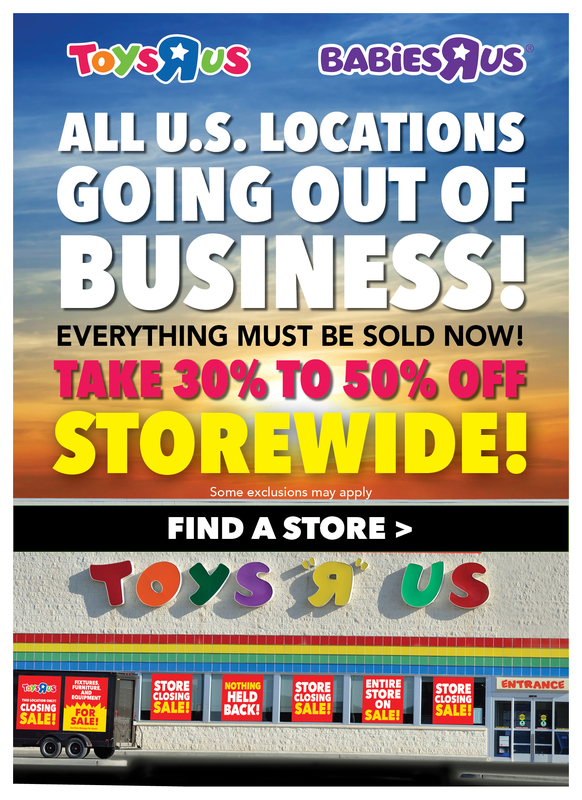 While their online store has been closed for some time now, Toys R Us still has a site up and running with a store locator and updates regarding the sale. To find a store or more info on the sale and the closure, head here. TrU is closing: Oh no! The last dedicated toy store is dying. Share pictures, memories and your last purchases, boo hoo! Announces its return: How dare those bastards do such a thing? Dead is better! Dead. Is. Better! This thread in a nutshell. With toysrus coming back under a new name, I guess it's back to business mapping out the stores on vacation. It'll be quite a while, if ever, before it gets to that level. I'm just glad that I can still get the True Heroes stuff if that's their plan. Their figures may be bland but their vehicles and playsets are aces. I couldn't agree more. I use true heroes vehicles with my transformers…. especially the live action transformers. Their prices have skyrocketed. TRU was over $1B in debt when it was bought in the leveraged buyout. Don't remember it was quite that much but after the sale it shot up to 5 or 6 billion in Dept. But your right I was confusing it to when the original owner/manager stepped down in the mid 90's. The company was in much better shape then, but 5 or 6 years later Wal-mart was out selling them. So they tried to go bigger like opening up that Toys R us in times square. Toys r us was doing fine, what was hurting them was Kids R us and Babies R us which many were closed and I believe all Kids R us were. Those were created after the original owner left. That was how they got in dept. But no where near as much as they would after the buyout. Then they started buying out other Toy companies Etoys.com and Toys.com, and toy retailers KB Toys and FAO Schwarz. Yes that's why those went away, they wanted to be the only toy store. And the dept kept growing. It was a Giant Scam, three companies bought a successful Toys' R Us in 2005 in a leveraged buy out. They cut spending at the company upped the prices, borrowed all the money to buy the company in the the first place. Then borrowed more money in the company's name after they bought it. So it went overnight from a successful company with a balanced budget and a profit margin, to a company that That owed billions of dollars because of how much money they'd borrowed to buy the company. Then the internet market took off and any chance they had went down the tubes, they then spent the next ten years just barely able to make the payments on all the money they owed. Finally they couldn't keep up. Then they ran the last scam where everyone was fired, they closed all the stores, the executives all got bonuses, and they seem to have found away to avoid paying back most of the money owed back to the employees while selling the rest of the company's assets back to themselves and starting over. Keep in mind it was the debtors that ultimately forced this whole situation, so yes it's still basically the same owners here. The American employee is not treated on the same level as the shareholder and until that changes, you will see situations like this more often and it will get worse. If the government didn't just make it readily apparent over the last month, the people in power will get away with as much as you let them get away with. There is no line that will not be crossed. If you don't like it, you have to fight back. That's done with your wallet and at the ballot box. And it's never being afraid to speak the truth, whether people can handle it or not. The flat modern Geoffrey is sterile and lifeless, like it was designed by committee. It's the same when you look at how Mario was drawn back around the 2nd and 3rd games versus that awful plastic 3D version they've had since the GameCube. I'm glad TRU is back in a somewhat different capacity, but man, I hate that freaking Giraffe. Looks like he's on acid with his big, bugged-out eyes. They should have gone back to the Giraffe of the 80's and 90's. That's not the plan. The plan is to do "store-within-a-store" displays with True Heroes, Imaginarium and whatever other off-brand toys they own the IP on. My suspicion is that they hope to raise easy capital this way and then use that to potentially reboot the stores in the far future. But they'll need a LOT of that easy capital to make it work. I don't know how many parents are going to rush out and buy that off-brand stuff at potentially higher prices than before – but I guess you never know. But yes, it feels a bit like "Weekend at Bernie's" with a toy store instead of a corpse. I wouldn't be surprised if they just opened up some new stores inside shopping malls. Sears is one foot in the grave and Younkers just shut down all its stores so there's so space available. Look at what they've pulled off so far. If I was a betting man, I'd put money down on 'em. Well, slapping a sticker on product you already own and is probably just sitting in a factory somewhere while getting a "Midwest-based retailer" to agree to let you sell you wares through a special toy section isn't rocket science. It's considerably easier than creating an infrastructure to ship toys to as-of-right-now non-existent warehouses to as-of-right-now non-existent big-box stores in 500+ medium to super-large market across the nation. Seriously, this is about the laziest way of making a buck as they can find to do. "Down the road", though. Not "tomorrow". Not "this year". Probably not even "next year". Maybe "not at all". I'm still trying to figure out where anyone is getting the idea that they're "opening" anything. This isn't even a pop-up store situation. This is the current TRU IP owners realizing they still own the rights to True Hero (and other TRU KO brands) and want to shove it into a already existing mall store with a sticker of Geoffrey's noggin slapped on it. I mean, former employees can get mad at that I guess… I just don't understand why. It would be like Kroger shutting down and then getting upset as a former employee if I saw Big K being sold at Walmart. That was my mistake. Yes, Charles Lazarus, founder of TRU, died roughly the same time as his store did. I was temporarily confusing his name with Larian, the owner of the company that makes Bratz, who had put in an offer to save the US stores some time back, but whose offer was rejected by the debt owners as being too low. He's said something recently about refusing to support this new venture, ostensively on the grounds that it was unfair to the former employees of TRU. Larian said the news is another sign that the lenders and other financial firms never intended to save the company, but planned all along to dismantle it and keep the best parts for themselves, for their gain. "I am so angry," Larian said. "This is unbelievable – 33,000 people lost their jobs, more than that. They destroyed a brand that's been around for 70 years for their short-term … gains." 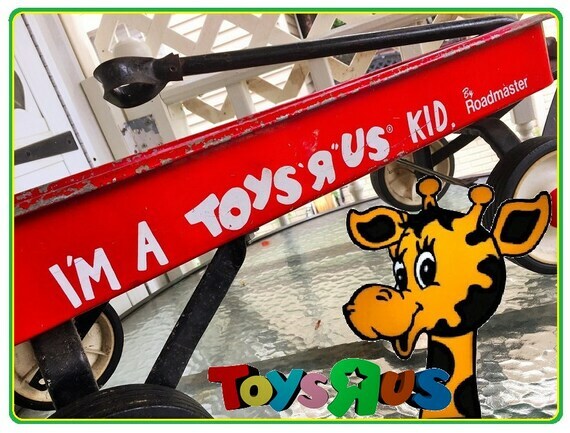 Back in March, Larian received national attention when he offered to buy the American and Canadian businesses of Toys R Us, and said he would raise money from investors and a crowd-funding campaign on the internet. The campaign took off, with parents and even Toys R Us kid-customers making individual contributions of $10, $50, or more. 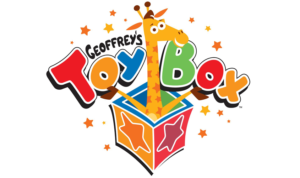 Might Hasbro get any Geoffrey's Toy Box questions during their upcoming earnings conference call, or has that ship completely sailed? For what it's worth, I read that he is. If I stumble across the link again, I'll share it. Since Im the black sheep of this forum, the Shepard Prime keeps following me.